“It’s going to be a tough act for the kid to follow,” said Cleveland pitcher Bob Feller. Indeed it would be. 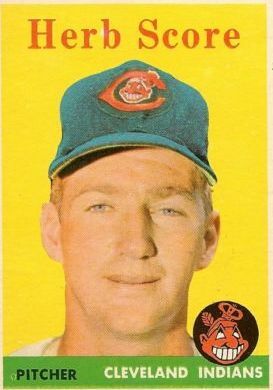 Feller had just thrown the 12th one-hitter of his fabulous career, blanking Boston, 2-0, in the first game of a doubleheader at Cleveland on May 1, 1955. Boston catcher Sammy White singled to center field in the seventh inning for the only Red Sox safety. He had been kept alive at the plate when Tribe catcher Jim Hegan could not corral a foul tip on a 2-2 count. The 36-year-old Feller, who had not been given a starting assignment by the Indians in the previous season’s World Series, reminded those who had written him off that he could still contribute in a big way to arguably the best pitching staff in baseball, even in his 17th season in the major leagues. But the promise of future greatness that shined so brightly in that game was not to be fulfilled. After Score pitched two outstanding seasons for the Tribe, in 1955 and 1956, his career was curtailed by a line drive that struck him in the face on May 7, 1957. Score returned to pitch the following year, and always denied that the ball hit by New York’s Gil McDougald cut short a productive career. But Cleveland fans will always ponder what kind of a career Score could have had after posting a won-loss record of 38-20 before the injury, as opposed to his record of 17-26 after it. Herbert Jude Score was born June 7, 1933, in Rosedale, a neighborhood in the Queens section of New York City. He was the oldest of three children – the others were sisters Helen and Anna Mae -- born to Herbert A. Score, a New York City police officer, and Anne Score. Herbert worked traffic duty in Manhattan. As a child, young Herb was stricken with many injuries and ailments. When he was 3, he was run over by a truck that crushed both legs just below his pelvis. Doctors were worried that he might never walk normal again, but the bones settled back into place on their own. Herb was stricken with rheumatic fever a few years later and was bedridden for ten months. As a freshman in high school, he fractured his ankle while playing basketball, and while the cast was still in place, he suffered through an emergency appendectomy. Anne Score was a devout Catholic and gave her son the middle name of Jude, in honor of St. Jude, the patron saint of hopeless causes. Both Score and his mother believed that his many recoveries were due to devoted prayer. At Holy Name of Mary School, he was playing the outfield when the team needed a pitcher. Score volunteered to step in. After the game the team’s coach, Father Tom Kelly, informed Herb that his outfield days were over. His days at Holy Name were over as well when Anne Score, who was separated from her husband for several years, relocated the family to Lake Worth, Florida, so she could take a job at a bank. Lake Worth, a suburb of West Palm Beach, was a small town, and word about young Score’s pitching ability spread fast. Cleveland scout Cy Slapnicka, who had signed Feller in 1936, lived in Lake Worth. On a tip from a local policeman, Slapnicka scouted Score, and liked him instantly. Score averaged two strikeouts per inning in his high-school career. He also pitched a half-dozen no-hitters. Although he threw very fast, he was also very wild. In one instance, Score threw a no-hitter against rival Fort Pierce in 1952, striking out 14 batters while walking nine in the 5-1 victory. Because of Score’s ailments back in New York and the loss of his transcripts, he was behind his classmates and did not graduate with his class in 1952. Major League Baseball forbids its teams to negotiate with high-school players until they graduate or reach their 19th birthday. So on June 7, 1952, when Score turned 19, he signed a contract (which had a $60,000 bonus attached to it) with Slapnicka and the Indians. Score was sent to Indianapolis of the American Association, where he made 10 starts, posting a 2-5 won-loss record. He allowed only 37 hits in 62 innings, but walked 62. Score won 7 games and lost 3 at Reading, giving up only 64 hits in 98 innings but walking 126, when an injury curtailed his season. He was in the outfield chasing fungoes when one sailed over his head. As he leaped to catch it, he fell on his left shoulder. X-rays revealed that the collarbone had separated from the shoulder. Score was shelved for the rest of the season, and did not throw again until the first of the year. The time off was not a total loss for Score; he was able to complete the needed credits to receive his diploma from Lake Worth High School. For the 1954 season, Score and Colavito, along with Reading manager Kerby Farrell, were promoted to Triple-A Indianapolis. While the Indians were setting an American League record for wins in 1954, with 111 victories, Score was also having a record-setting year. He had a lethal fastball to go with a solid curve and changeup. “A change can be an effective pitch, but only to a good hitter, to get his timing off,” he said years later. “A bad hitter can’t hit a good fastball. Throw him a change and you do him a favor.” In his delivery, Score took a big windup, turning his body away from the batter, uncoiled, and threw the ball to the plate. He barely glanced at the batter or the plate, and when he concluded his delivery, he was in a defenseless position on the mound. Even though the Indians set a league record for victories in 1954, they went into 1955 spring training feeling a little unsatisfied; they had been swept in the World Series by the New York Giants, four games to none. Still, their pitching staff was considered to be the best in the league. It was led by 23-game winners Early Wynn and Bob Lemon. Mike Garcia captured 19 victories, Art Houtteman had 15, and Bob Feller had 13. Feller was coming to the end of his brilliant career, and most felt that Score could be slotted right into the rotation. He was already being referred to as a “left-handed Bob Feller.” The Sporting News picked the Indians to repeat as kings of the American League, based on their strong pitching. Two weeks after his 16-strikeout effort against Boston on May 1, Cleveland visited Fenway Park for a two-game series. Many teams avoided starting a left-handed pitcher, much less a rookie, at Fenway Park because Boston could stack its lineup with right-handed hitters. The Red Sox would try to take advantage of the left-field wall and the short distance for a home run. A reporter asked Cleveland manager Al Lopez if he was afraid to start Score in this situation. Lopez grinned and replied, “I’m not afraid to pitch Score any place. Any place, or against anybody.” The Señor knew his pitcher: Score threw a three-hit shutout, striking out nine. His early success put Score on the cover of the May 30 issue of Sports Illustrated. The article was about Score and “Bullet" Bob Turley, a young, promising right-handed pitcher of the New York Yankees. The Indians were nip and tuck with New York all season, pulling ahead by two games after sweeping a doubleheader from Washington on September 13. But the Indians went 3-6 to close out the season, while New York thundered home with a 9-2 record to capture the pennant. The Indians finished three games behind the Yankees with a record of 93-61. As for Score, his inaugural season was one for the record books. He led both leagues with 245 strikeouts, shattering the rookie record of 227 set by the Phillies’ Grover Cleveland Alexander in 1911. Score’s record stood for 29 years when Dwight Gooden of the New York Mets struck out 276 batters in 1984. There was no sophomore jinx for Score in 1956. He won seven of his final eight starts to post a 20-9 record, sharing the team lead in victories with Lemon (20-14) and Wynn (20-9). Score led the league in strikeouts (263) and the team in ERA (2.53). His strikeout total was the most since Feller struck out 348 in 1946. Score became the first pitcher in modern baseball history to strike out more than 200 in his first two seasons. He was again named to the American League roster for the All-Star Game, and pitched one scoreless inning. Cleveland had again been a pennant favorite in 1956, but again the Tribe lost out to the Yankees. The Indians finished in second place with an 88-66 record, nine games back. Lopez resigned at the end of the season. He denied rumors that he had had differences with general manager Hank Greenberg. Lopez had built a solid record as the Tribe’s head man, but he felt it was just not enough to keep going. Kerby Farrell assumed the reins of the Indians for the 1957 campaign. Farrell was reunited with Score and Colavito a third time, having managed both players at Reading in 1953 and Indianapolis in 1954. Both teams had won the pennant. Farrell may not have had Score on his pitching staff if Joe Cronin had his way. The Boston general manager and former Red Sox great let it be known that he had offered Greenberg a million dollars for Score. (That sum was the equivalent of more than $7 million in 2009 dollars.) Cronin insisted that the offer was no joke. “I was and am definitely serious certainly the offer was made in good faith,” he said. “Greenberg’s mouth shot open wide, there was a bright gleam in his eye, and then he said, ‘Joe, I could not let you have Score.’” What was Score’s reaction to all of this? “I wonder what Nancy will think when she reads that I am supposed to be worth a million dollars.” Nancy McNamara was Herb’s fiancée, whom he had met at Lake Worth High School. She was attending St. Mary’s College in South Bend, Indiana. For Score, his career took a tragic turn when on May 7, 1957, he was struck in the eye by a batted ball. He was pitching the first inning of a home game against New York when Yankee shortstop Gil McDougald, the second batter he faced, smashed a line drive back towards Score. The ball hit Score in the right eye and ricocheted to third baseman Al Smith, who threw to first base for the out. But McDougald was not running down the first-base line. Instead he ran to the pitching mound, where Score was lying with his glove covering his eye. Because of Score’s delivery, he was defenseless against a batted ball after he threw. Score was taken to Lakeside Hospital. He had suffered a broken nose, a lacerated right eyelid, damage to the right cheekbone and damage to the right eye. Score kept his thoughts to St. Jude, praying and appealing to the saint to be by his side once more. McDougald was an emotional mess after the incident. He was put at ease somewhat after a long conversation with Anne Score, Herb’s mother. Nancy, his fiancée, rushed to Cleveland when she heard the news. Score was hospitalized for three weeks, until May 28. Although he looked fit and fully recovered, Score was months away from the playing field. He sympathized with McDougald: “I talked to Gil and told him it was something that could happen to anyone. It’s just like a pitcher beaning a batter. He didn’t mean it.” McDougald lost his desire to play baseball and retired after the 1960 season. Whether or not the incident with Score was responsible, the Yankee’s average dropped from .289 in the seven years before 1957 to .253 from 1957 through 1960. Herb and Nancy had become engaged earlier in the year and planned for an October wedding. Since Herb was on the shelf as far as baseball was concerned, they moved their wedding day up to July 10 in Boynton Beach, Florida. Score’s old baseball coach, Father Kelly, officiated at St. Mark’s Catholic Church. Score did return to the team before the season ended to take some batting practice and shag fly balls in the outfield. He was still quite a way from pitching. His eyesight had improved greatly, but he was having difficulty with depth perception and things were blurry up close. He still could not read with his right eye but was encouraged that his eyesight would make a complete recovery, based on his doctors’ prognosis. But Score would not pitch again in 1957. As a team, Cleveland finished with a 76-77 record, in sixth place and 21½ games behind the Yankees. It was the first time the Tribe had finished under .500 since 1946. Not only did they lose Score for the season, but Lemon developed bone chips in his right elbow. He was shelved for the final two months of the season. Farrell was fired at the end of the season. He and Yankees manager Casey Stengel met up at the World Series in 1957. Farrell relayed what Stengel told him: “Remember what I told you last spring? You lost your job on May 7. They just retained you after that.” General manager Hank Greenberg was also relieved of his duties after the season. Bobby Bragan was the new manager for 1958, chosen by Frank Lane, who succeeded Greenberg. Bragan had managed previously in Pittsburgh. Lane had also served as GM for the St. Louis Cardinals and Chicago White Sox. “Trader” Lane loved to make deals. “You can’t fall in love with your own players in this business,” he would say. “I’m crazy about a lot of them, but I can’t let personal feelings stand in the way of a trade.” With the Indians, he wasted no time in making trades. In the offseason, Wynn and Smith were dealt to the White Sox and Hegan went to the Tigers. During the season, Garcia was released in May, Roger Maris was traded to Kansas City in June, and Lemon was released in July. Indeed, Score looked like himself when he beat Billy Pierce and the White Sox, 2-0, on April 23. Score surrendered three hits and struck out 13 to raise his record to 2-1. A week later on a damp night in Washington, Score was pitching in a close game. His left arm began to get sore in the fourth inning. In the seventh inning he threw a pitch that bounced in front of home plate by about ten feet. He threw another pitch, but got the same result. He had torn a tendon in his left elbow and was sidelined for a month before he could start throwing again. When Score returned on June 14, in Washington, he relieved Cal McLish in the seventh inning with the Indians leading 10-2. In the ninth inning he felt the pain in his elbow again; the elbow felt as if it had been stabbed with a knife. “I thought Herbie slipped as he threw the ball,” said teammate Mudcat Grant. “I was in the dugout and I swore that I heard something pop in his arm.” Score made only seven more appearances (one start), the rest of the year, and finished the season with a 2-3 record. It became apparent during the season that Lane did not like to keep his managers intact, either. Bragan was fired after 67 games and was replaced by former Yankees and Indians great Joe Gordon. Gordon piloted the Tribe to a 46-40 record the rest of the way and a fourth-place finish. It did seem as though Score was back. He pitched his way to a 9-5 mark in the first half of the season. In three of those wins he had double-digit strikeout totals. But in nine starts in the second half of the season, he was 0-6. The Indians battled Chicago all season long, holding a two-game lead at the All-Star break. Cleveland was riding an eight-game winning streak and trailed Chicago by 1½ games on August 27. Chicago visited for a four-game series that weekend and swept the Indians, virtually putting the pennant out of the Indians’ grasp. Cleveland broke camp in 1960 and headed north to begin another season. Optimism was high for the Tribe even though 1959 had ended with a loud thud. The real thud was about to hit Indians fans square in the head. On Sunday, April 17, Cleveland and the White Sox met for their final preseason tuneup, in Memphis, Tennessee. During the game, Gordon informed Colavito he had been traded to Detroit for Harvey Kuenn. The home-run king was traded for the batting average champion. Colavito was the face of the Tribe, the idol for all Indians fans. “Don’t Knock the Rock” was the mantra of many of Colavito’s followers. GM Lane had coveted Kuenn for a long time and thought that the home-run ball was overrated. It was rumored that Lane was jealous of Colavito’s popularity with the fans. Whatever Lane’s motive was, it is still considered the worst trade in Indians history. Lane just did not understand that not only was Colavito the heart of the team, but he put people in the stadium seats. Many people called in to the papers complaining of the trade, vilifying Lane, and threatening never to go to another home game. It was a black day for Cleveland. Score, Colavito’s roommate, was given his ticket out of town to Chicago the next day. Lane was living up to his slogan on dealing players; “Don’t cry about a bad deal, go on to the next one.” Lopez had taken the reins in Chicago after he left Cleveland. White Sox owner Bill Veeck, no stranger to rolling the dice via the trade himself, sent pitcher Barry Latman to Cleveland for Score. “I’ve never seen Al want a player as badly as he wanted Score,” said Veeck. With Colavito and Score traded, that left infielder George Strickland and Nixon as the only Indians remaining from when Lane took over the club at the end of the 1957 season. Score started 22 games for the White Sox in 1960, going 5-10 with a 3.72 ERA. There were some bright days, but for the most part he couldn’t regain the speed on his fastball. Also, he lost the movement on the ball. It went straight as an arrow. In June 1961, he was optioned to San Diego of the Pacific Coast League. “We had a long talk with Herb and he was agreeable to the move,” Lopez said. “There’s nothing wrong with his arm. He can throw hard on the sidelines for 45 minutes solid. If there was anything wrong with his arm, he couldn’t do that. What he needs most is control.” Score went 7-6 for the Padres, but his ERA ballooned to 5.10. For his career, Score was 55-46 with a 3.36 ERA. Before being struck by the line drive in 1957, he was 39-20 with an ERA of 2.46, and struck out 547 batters in 512 2/3 innings. After 1957, Score was 17-26 with an ERA of 4.70 in 345 2/3 innings. To his credit, he never used the accident as an excuse. He did not blame anyone, and always claimed that his pitching problems had more to do with his arm troubles in 1958 than his damaged eye in 1957. Lane left Cleveland after the 1960 season to assume the same responsibilities in Kansas City. Gabe Paul came over from Houston to become the Indians’ new general manager. Score was passionate about baseball. He didn’t pretend to be interested or speak in an exaggerated voice the way some broadcasters have done. Score was genuine. He was beloved by fans all over, but especially those in Cleveland. Many did not know that he had a playing career, and that included some of the younger players. But that was OK with Score. Broadcasting baseball was his career; playing it was in the rear-view mirror. He was not highly polished; at times he may have given the wrong venue where the team was playing, or he did not give the score or the inning of the game often enough. But that was OK, because Score was real, and the fans adored him, even if he didn’t always understand why. To Herb, the players were the stars, not the broadcaster. He didn’t feel the need to give expertise on every play, or dwell on a bad play. He was seldom critical of a player or a manager, trying to be objective at all times. He always felt that fans should remember what happens on the field, not what is said in the booth. For the first 30 years of Score’s broadcasting career, the Indians were for the most part a horrible team. They never seriously contended for the playoffs, finishing at .500 or higher only six times in those 30 years. “Herb Score has probably watched more bad baseball than anyone in the history of the game,” Tait said. In 1998, Score was involved in a traffic accident near New Philadelphia, Ohio. His car pulled out in front of a tractor-trailer. He suffered hip, head, and pelvic injuries. He recovered from the injuries to make a handful of public appearances, but he suffered a stroke in 2002. He then had bouts with a staph infection and pneumonia. After a lengthy hospital stay, Score died on November 11, 2008. He was 75 years old. He was survived by his wife, Nancy, and three children, David, Mary, and Judy. He was preceded in death by his daughter Susan in 1994. That was Herb Score. Positive at all times. A gentleman at all times. He was a man who always saw the glass as half-full. This biography was published in "1995 Cleveland Indians: The Sleeping Giant Awakes" (SABR, 2019), edited by Joseph Wancho. Pluto, Terry. The Curse of Rocky Colavito. New York: Simon and Schuster, 1994. Various issues of The Sporting News. Various issues of Sports Illustrated. Various issues of Baseball Digest. Various issues of the Cleveland Plain Dealer. Various issues of the Cleveland Press. Various issues of the Cleveland News. Various issues of the New York Times. Various issues of USA Today. Various issues of the Fort Pierce News-Tribune, Florida. Correspondence with Joe Tait, April 2009.